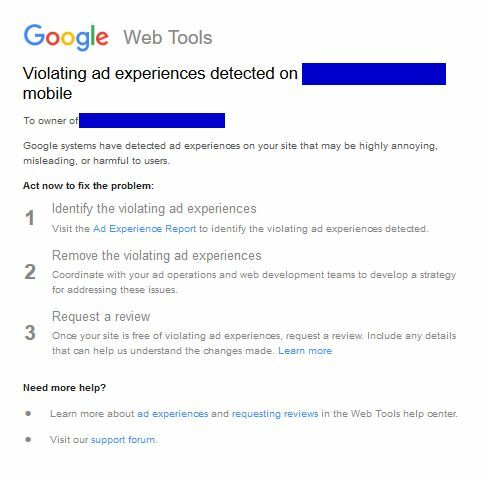 Google has begun sending out a new warning related to the Ad Experience Report added earlier this year. The violation notices warn of specific infractions related to the Better Ads Coalition with the way site owners have implemented ads on both desktop and mobile sites. This new violation does require site owners to file a reconsideration request, which can be accessed right from the Ad Experience Report for any site that has received a notice. But as of right now, there is no penalty or impact for not doing anything if you get a notice. Google confirmed to The SEM Post that this will change in the future, as well as having a set time that site owners will have to fix ads before they are filtered out automatically by Chrome. And here is how it appears in the Ad Experience Report. Once ad filtering begins, it seems that it will be flagged here. It is worth noting that the comment field for the reconsideration request is prefilled by Google, and is only a suggestion. By comparison, here is how it would appear if the site was checked and found to be in compliance. But Google has also said that sites are periodically reviewed, but would not give specifics on how frequently – or not – this would happen. It isn’t clear if it is manual processed initially, or if it is automated, but the review process seems to be handled manually. How and when Google decides to review a site isn’t known either, since many site owners still see “Status: Not Reviewed” when they check their sites. When testing sites for the Better Ads Standards, we try to account for spurious experiences by testing multiple pages, multiple times, and only failing a site if it looks like the violations are pervasive. Wherever we draw the line between Failing and Warning, a site may fall on either side of it depending on which pages we reviewed and what ads showed up. The best way for publishers to ensure that they will not be impacted is to eliminate all the violating experiences on the site, rather than trying to find the exact boundary between failing and warning. It is not clear if these are impacting rankings in Google right now. In the above example, both the mobile and the desktop version of the site are still in Google search, so it doesn’t appear to be a site-wide manual action. But this could change, or the ones flagged as “status: failing” might be impacted while “status: warning” are not. 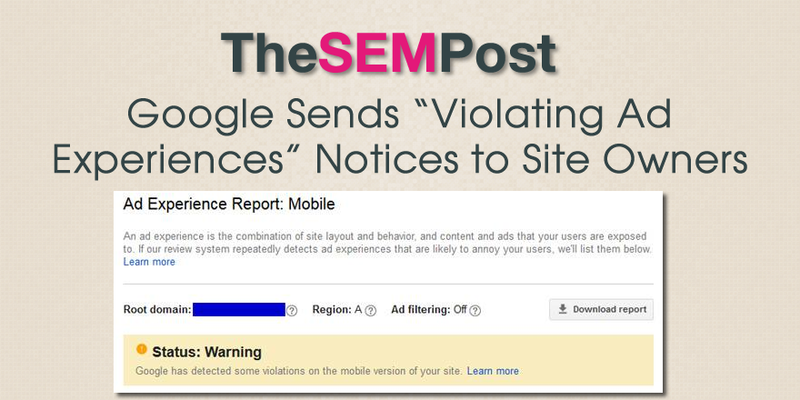 Google also clarified that these issues “may impact the site”. If a site is in a “failing” or “warning” state, their Ad Experience Report will include these visuals, along with information about the Better Ad Standards and how the issues may impact their site. I asked Google for more information on these notices and the potential impact they have to sites in the search results or as viewed in the browser. They confirmed that in the future, site owners will have 30 days to correct issues and clear the failed warning before the Google Chrome browser will begin filtering the ads. They do not have a confirmation on when this phase will launch, but said sometime in 2018. Violations can also be targeted to desktop or mobile, or both, depending on how the site owner adds advertising to the pages. There are two different reports. 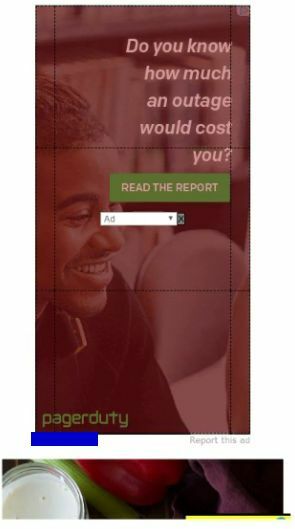 This particular warning was for having ads in excess of 30% of the mobile screen for the main part of the page, and Google provides a screenshot of the page they saw the violation on. This screenshot is pretty nice for site owners, especially for those who may not be aware of the type of ads their ad networks are running – it isn’t uncommon for site owners to be surprised at the ads running on their own sites. The interesting part is how Google is currently calculating the 30% – it is not the viewport (what is seen on the screen) but rather the size of the ad in relation to the page itself. However, this would definitely raise concerns that site owners could artificially increase the length of the page to compensate for this. Google will also include video of some of the examples as well. For ad density, it does appear Google is planning to be more transparent in the future, beyond a simple screenshot, so that site owners could know whether or not their pages or sites are likely to get a notice for this. We’re working on providing more detail around ad density in our Help Center and newer videos for Ad Density violations in the Ad Experience Report will even show what ads are included in the calculation as well as how “main content” is determined for a given page. On desktop, 97% of the violations were popups. On mobile, 54% of issues were popups. On mobile, 21% of the issues were high ad density. One of the ad networks that is triggering the manual action is Mediavine, which is a popular ad network with food bloggers. However, there are other ad networks that are triggering this. And not only that, some ads within a network are fine, but other sizes or implementations are not. 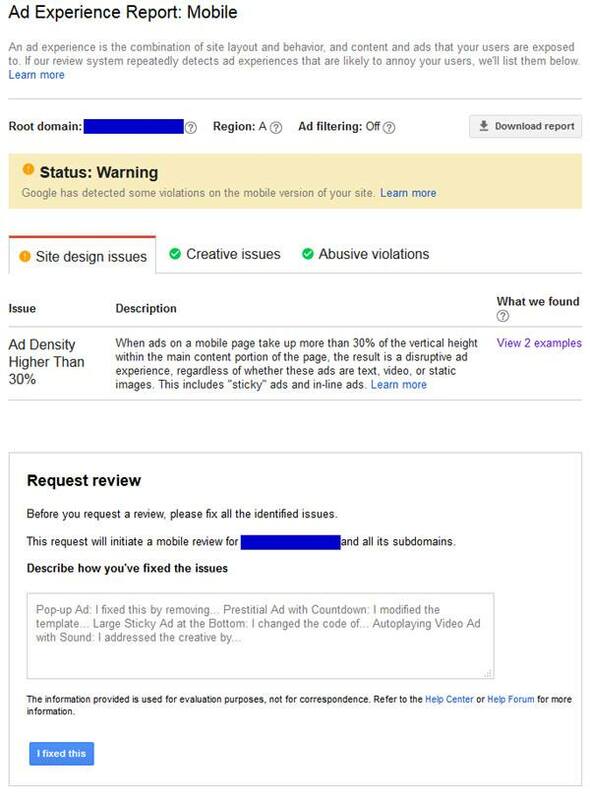 There are also reports that the newer AdSense Vignette ads are also trigger this same warning, but according to Google, these have been incorrectly classified as pop-up / prestitial ads. Casey Markee of MediaWyse who works with many recipe bloggers sent the screenshots to The SEM Post. He noted that the sites that had received notices were fully indexed in Google for both mobile and desktop, which confirms what Google said that these notices would not have any impact until next year. Markee also says that “it’s clearly bad and you want to correct,” if you receive a notice. He also expects more of these notices to come. Many site owners still show their sites as not having been reviewed yet, so we will see more of these, especially as it gets closer to 2018 and the yet to be confirmed date when Chrome will begin filtering those violating ads automatically. Much like mobile interstitials were at one time okay in terms of Chrome ad experience, these 300x600s are *currently* acceptable. But, similar to when they started warning about the mobile interstitial needing to go, that’s what’s happening here. This is a Chrome change that we expect to come in 2018. We’d prefer to let each site owner decide whether they want the loss of revenue for Q4 while these are still okay, but the units will be removed from the network before any manual actions would apply. Of course, if the date gets moved up, we would immediately disable them from the network. Anyone with Mediavine can log into their dashboard right this moment and disable this unit from their mobile offerings. Anyone that knows us knows that user experience is as important to us as it is the pubs we work with, because we run these same ads on the sites we own. We will never do anything to put your standings in jeopardy.